It’s hard to imagine your housecat as a particularly savvy killer. Sure, it may swat at a shoelace dangled in its face, or bunny-kick its favorite fish toy when it’s in, you know, a mood. It may even catch a bug now and then. But your cat probably spends most of the day delicately curled up on the couch, seemingly content to do absolutely nothing. Hugh McGregor, a biologist at the University of Tasmania who’s been studying feral cats for years, has examined this cunning predation strategy. Cats can locate wildfires far off in the distance and then travel to the burn scars weeks later to feed on mammals whose homes just went up in flames, as McGregor discovered after reviewing data from 32 felines with GPS collars. In one case, a cat traveled nearly eight miles to a fire scar. In another, its path was so direct that McGregor thought the tracking device had malfunctioned. But in all events, the reward was worth the journey: a bounty of prey with nowhere to hide. “Hunting attempts in burn scars are three times more likely to end in a kill,” said Sarah Legge, a biologist at the University of Queensland, who worked with McGregor on the project. It’s a dire situation for animals who survive the smoke and flames. “If you’re a small mammal living in an area that’s burnt by fire, your mortality goes up about 20 times,” she said. That’s not because they’re harmed by the fire directly—it’s a result of heightened predation, she said. McGregor and Legge attached camera collars to feral cats in Australia in order to learn more about how they hunt. He also wondered if feral cats have some form of rudimentary communication. “Not anything complex, but maybe a way of communicating something simple” to close kin, such as where the nearest fire scar might be. That might explain how cats navigate so effectively, he said. Cats aren’t just attracted to recent fires. Downpours in the desert, for example, are often followed by a boom in small mammals, McGregor said, which wild kitties also seem to know about. After a big rain they appear in droves, he said, as if someone sent out a free food email complete with a map. These cats seem unstoppable—or at least, highly adaptable, Legge said. It’s not only mammals they’re hunting. 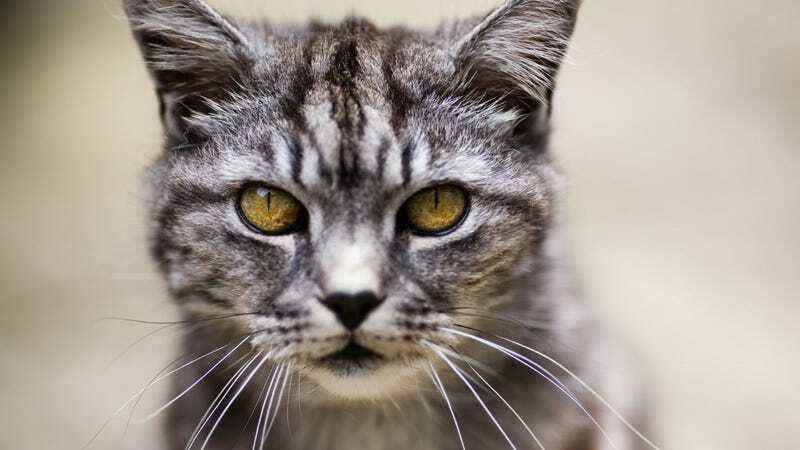 According to the Australian Wildlife Conservancy, feral cats kill more than a million birds and well over a million reptiles every day, amounting to a death toll of 2,000 native animals every minute. In fact, not even poisonous snakes stand in their way. They eat those, too. “It proceeded for 10 minutes to chew the neck off,” McGregor said, describing an observation of a cat eating a brown snake, one of Australia’s most deadly. “It obviously knew if it digested the head it would die.” And so the clever kitty severed the head and slurped the body down like spaghetti. A feral cat eats a crimson rosella bird in Australia. With tactics like these, native species should be absolutely terrified of feral cats. And yet, they’re blithely unaware of the danger, since local animals didn’t evolve alongside feline predators. Cats have been altering ecosystems Down Under ever since they were introduced to Australia in the 17th or 18th century by Europeans. They’ve established feral colonies that now cover more than 99 percent of the continent. And they’ve been chewing on far more than shoe strings since they arrived. In just a few centuries, cats have been implicated in the extinction of more than 20 mammals, including the lesser bilby and the desert bandicoot, giving Australia “the worst mammal extinction record in recent times,” said Karl Vernes, a biologist at the University of New England in New South Wales. As these tiny terrors have done irrevocable damage to so many native critters, humans have had to intervene. Earlier this year, the Australian Wildlife Conservancy completed the world’s largest cat-proof fence, which encloses an area they’ll stock with native species. And last year, the government announced a more dramatic approach: the culling of 2 million cats (which currently number between 2.1 million and 6.3 million) by 2020. McGregor said conservationists should also find ways for feral cats and native wildlife to coexist. That might mean teaching small mammals to fear invasive predators or controlling the frequency of wildfires (which have seen an uptick following the introduction of grasses brought in for cattle grazing, Vernes noted). But you can’t blame the cats—a predator has gotta eat. So now, more than ever, is a great time to remind you to keep your pet cat indoors, lest it unleash its formidable hunting prowess on local wildlife.